Continuing my look at books inspired by Mary Shelley’s Frankenstein. Today is a series that is a direct sequel to the original Frankenstein by popular thriller writer Dean Koontz. This book was first published in 2005 and is book 1 of a (so far) 5 book series. I actually got books 1 and 2 for Christmas from my brother back in 2006 but never got around to reading them. Koontz is a very popular horror/thriller writer. He wrote the popular Odd Thomas series and many years ago I read two other books by Koontz, Watchers and Hideaway. They were both well-paced thrillers, but nothing to get super excited over (I’ve not read another of his books since). This Koontz Frankenstein series is fairly popular so I thought it would be a good time to give it a shot. And the verdict is…AWESOME. This is a suspense filled, tightly paced thriller. I loved every page of it. There are numerous subplots going on and despite being nearly 500 pages, it’s a fast read. I originally thought Koontz was completely re-writing the Frankenstein story, but this book is actually a sequel, taking place 200 years after the events in Shelley’s novel. Two New Orleans detectives are on the trail of a serial killer known as The Surgeon who is stealing victim’s body parts. The killer keeps eluding the police and the city is held in fear of this madman. The original Frankenstein monster is summoned by an old acquaintance from his hiding place within a secluded monastery to come to New Orleans and determine if his creator is back performing experiments. It’s an intriguing premise written with speed and lots of action. Also, this book is obviously a series, so you get some closure in this book, but it’s left wide open for the sequels. I don’t want to give much more away, but I highly recommend this book and I look forward to reading Book 2: City of Night. In fact, I enjoyed this book so much I may go ahead and order the first book in the Odd Thomas series from PaperbackSwap. Koontz (with the help of co-writer Kevin Anderson) may have just shoehorned himself back into my reading list. This entry was posted on October 21, 2009 at 8:00 am and is filed under books, Frankenstein, Halloween, holiday with tags AWESOME-tober-fest, AWESOME-tober-fest 2009, Book Report, book reviews, books, Frankenstein, Halloween, holiday, monsters. You can follow any responses to this entry through the RSS 2.0 feed. You can skip to the end and leave a response. Pinging is currently not allowed. I read book 1 and really liked it too, wasnt it creepy? I havent picked up book two yet, I have it in my TBR mountain. Odd Thomas was excellent. Enjoy it 🙂 I luv Koontz. Yeah, I’ve gone back and forth on Odd Thomas, but you recommended it to me a few months ago, and I went ahead and got it. I can’t wait to read it. 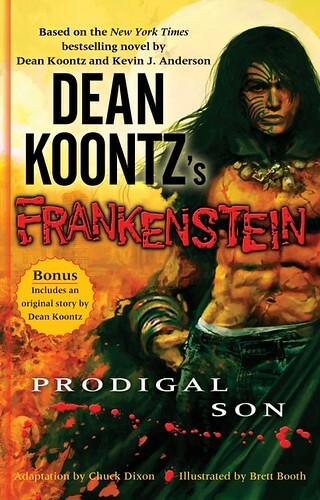 Koontz’s Frankenstein Book 2 is on my TBR pile right now. Book One and Book Two are good reads, but Book Three is a MASSIVE letdown and a total departure in tone from the previous two. It really, really, really sucked and was a very weak and disappointing ‘end’ to the ‘triology’. Those are in quotes because there is a fourth book that I think might even be out already, though I am certainly going to get it from the library and not risk wasting my money like I did on Book Three.